We’re all familiar with direct sales companies like Avon and Watkins. But what if you are looking for something different? What if you are looking for a unique direct sales opportunity outside of the traditional jewelry, makeup and handbags? Well, today’s post is for you! Below are some great opportunities offering a unique spin on the conventional business model. 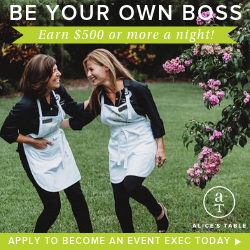 For people who want the chance to be creative through their business, Alice’s Table might be a good fit. The company was created in September of 2015 and is a lifestyle direct sales business that helps women launch a flower-arranging business. Even if you have no experience in flowers or floral design, Alice’s Table will provide you with the necessary tools and materials to start your business. Event execs can host public or private events at bars, restaurants, businesses, or homes. What sets this company apart from direct-sales companies is at the event you don’t have to worry about sales. Participants must purchase a ticket beforehand, and you receive a 70% commission on each ticket sold. The average range of attendees is 15 to 20 and each event, including set-up and clean-up, lasts for 3 hours. Event execs must have space to store the flowers, as they arrive the day before the event. This is one of the most expensive opportunities to join, with the start-up kit costing $699 because of all the reusable materials like aprons, clippers, buckets, spray cans. If you choose to work for Kaeser & Blair, you will cater to a different market than many other direct sales companies. The company produces promotional products and sells to businesses that require these specialty items. They sell things like drinkware, calendars, bags, writing instruments, wearables, buttons, stickers, sporting goods and more that are all customizable with a logo or company name. To get started, you can purchase an owner package for $85 or $299. After you make $1500 in sales, you are refunded back $85, regardless of which package you chose. Business owners start off earning a 50/50 split of the gross profit, but as you sell more, the commission percentage could increase to 65%. Kaeser & Blair’s Promotional Products Business Owners receive near-instant payment – once the order has been received, you receive your commission payment within two days if you have elected for direct deposit, or weekly via check. This direct sales opportunity can merge your love of cooking with children. The company aims to fight obesity by teaching children of all ages how to cook through hands-on classes. Before you can start teaching, you must take an 11 module course that teaches proper licensing, permits, food safety, marketing and more. After you receive your Healthy Hands Cooking Certification, you can become an instructor. The signup fee includes an $8,997 certification training, in addition to a $1,000 first year annual membership fee. You keep 90% of all class revenue. Healthy Hands Cooking provides a variety of recipes and age-appropriate lesson plans to help your classes run smoothly. If selling products at parties isn’t what you want to do, then consider bon COOK. Their consultants offer private cooking classes, which showcase their BPA and PFOA free, FDA certified kitchenwares and signature ingredients like herb and oil blends, balsamic vinegar, gifts sets, and more. To become a bontrepreneur, you must purchase a starter pack for $99, which includes kitchen and baking essentials. You can also elect to add-on a kit for $49.95, which contains key ingredients from their baking classes. Commission ranges from 20-31%, depending on your monthly sales and how many members you add to your team. bon COOK consultants can earn bonuses, trips, and gifts when they reach various milestones. Consultants working for LaBella Baskets & Gifts sell candles, chocolate covered treated, cookies, flowers, gift baskets, skincare items, jewelry, personalized gifts and more. Each Gift Consultant receives a personalized online store where they can sell the Labella Baskets & Gifts inventory. Most of your sales will be generated through social media and other online promotions, and you don’t have to host parties. You will have to pay a fee of $24.95 a month, which gives you access to the website, discounted merchandise, and a rewards program. The commission is paid out twice a month and ranges from 20-40% and depends on your sales and how many consultants you add to your team. pawTree is the perfect opportunity for pet lovers. The direct sales company focuses on providing customized nutrition for pets. Its product line includes pet foot treats and supplements that are free from artificial ingredients, grains, and poultry by-products. The company also offers its own line of food seasoning, which can help add nutrients to your pet’s diet. Consultants do not need to have any prior knowledge of pet nutrition to get started, as pawTree provides training and has a team of veterinarians on hand to assist with any questions. Consultants can get started by purchasing a starter kit that costs $99 or $125 and includes tools, food samples, and 6-months access to a custom website. pawTree consultants earn 10% – 20 % commission on personal sales, and you can make extra commission and bonuses by adding to your team and selling more each month. Tea Queens sells everything you need for a soothing cup of tea. This direct sales company’s product line includes all varieties of tea, including oolong, black, maté, green, matcha, white, and herbal tea, as well as teaware such as teacups, iced tea accessories, infusers and filters, teapots, and travel mugs. Tea consultants can join the team for $99 and receive a teapot, mug, and a plethora of tea samples. Typically, tea consultants will host either a tea break or a tea tasting. A tea break is a quick demonstration in an office or workplace during lunch or breaktime, whereas a tea tasting allows guest to learn about and sample different teas. Consultants receive a 25% commission on everything they sell, and can also earn a downline on consultants they add to their team. Chalk Couture is for people who love to DIY. The company is revolutionizing home decor with Chalk Transfers, Chalkology Ink, and its exclusive Boards. It allows its customers to create beautifully professional-looking chalkboards easily and quickly. Designers can join for $99 a month, and you receive sample products and all the necessary marketing materials, as well as a one-time discount of 55% to help jumpstart your inventory. You earn 40% on all the products you have in your personal inventory and resell to a customer, and 25% commission on all products you sell online. You can also earn bonuses and gifts based on your sales, as well as a downline commission on consultants you enroll on your team. Damsel in Defense is a unique company that aims to empower women by providing them self-defense tools to protect themselves, their family, their home, and even their online presence. The company’s product line includes clothes, stun guns, jewelry, pepper spray, entry alarms, and more. Commission starts at 25% but can increase to 30%. As with most direct sales companies, you can add to your team for additional bonuses and commission. To become a Damsel in Defense consultant, you can purchase a starter kit for $99 and host your first “Empower Hour” to teach other women how to defend themselves properly. Women who want to flex their creativity muscles should consider Charlee Jack Designs (CJD). Customers can choose the shape, size, color, and design of a sign and then can either create the sign at a hosted event or put it together whenever they have time. By the end of a Charlee Jack party, all participants will have created a professional-grade handcrafted sign. Consultants join for $149, which will include a tote, sign, paints, and brushes. Commission starts at 20% -30%, with a downline commission, earned based on any consultants you add to your team. You will also have to pay a $17 website fee. At the CJD parties, consultants never have to worry about making sales, because the attendees will already have purchased their personalized signboard before coming. At the parties, you will play the role of instructor, rather than a salesperson.